This Bed frame is engineered to provide maximum comfort, strength and versatility. The steel mesh platform creates extra storage space for small rooms. The compact design is a good alternative to split boxspring setups, and costs less money too. This Bi-Folding Metal Bed Frame is a versatile, storable bed frame engineered to provide maximum comfort and convenience. The metal frame can fold and unfold quickly and easily. When folded, the frame is easy to carry or store and takes up little space. The platform sits 14 inches off the ground, so there is ample space to store suitcases or other bulky items underneath, but your mattress will stay at a comfortable height from the floor. 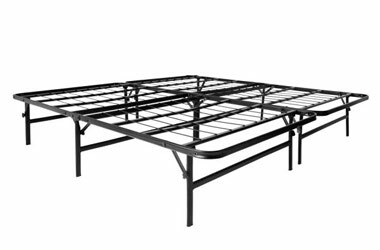 The metal wire mesh is designed to hold memory foam and standard spring mattresses with no box spring required. Eliminate all the wood and fabric of a box spring that could attract bugs. There is nowhere for bed bugs to live on this metal platform bed. The compact size also makes it portable and an excellent alternative to expensive split queen foundations that are required in some houses with narrow hallways or staircases. The strong yet light weight steel construction has been tested to hold 1200 pounds per section without sagging. The frame has a 10 year warranty. The bed frame comes preassembled. All you must do is remove it from the box and unfold it. Folding it up for storage is just as simple. The all steel frame is heavy duty and holds over 1000 pounds of weight, but does not require any heavy tools to assemble. No hammers, screwdrivers, wrenches, or cussing required. There are a few wing nuts that you turn with your fingers. It's so easy, even a caveman could assemble it! With more than twice as much storage as you get under traditional metal frames and platform beds, this platform bed is the best value option for any room. You can easily store suit cases, and other bulky items with easy access - No more high shelves or dangerous attics to enter. It is great for dorm rooms or other places with small closets. Copyright © 2005-2019 Michigan Discount Mattress LLC. All rights reserved.